Welcome to Our Ultimate Guide to the Best Large Breed Dog Food (Dry)! We review the very best options for meeting the special nutritional requirements for your large dog breed. Although Mastiffs, Dobermans, Saint Bernards and other large breeds are the same species as Poodles and Pomeranians, they obviously vary greatly in terms of size. But, large dogs also exhibit a number of biological differences when compared to their smaller counterparts. 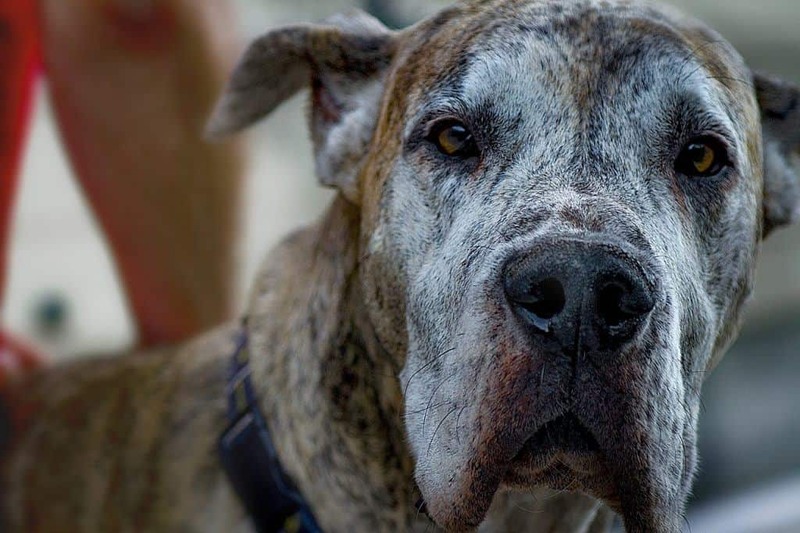 For example, large dogs are typically more likely to suffer from joint problems, such as hip dysplasia and osteoarthritis, than their smaller cousins are. Accordingly, it is important to find a quality large breed dog food to address your pet’s specific dietary needs. We’ll examine the best dog food for large breeds, and explore some of the differences between foods made for large and small dogs below. In addition to the characteristics you’d want in any dog food, you’ll need to look for a few key things when seeking a dog food for large breeds. This is most important while your dog is young and growing rapidly, but it is also important to provide large breed adults with a food specifically designed for them. The best large breed dog food should contain joint supplements, such as glucosamine and chondroitin. 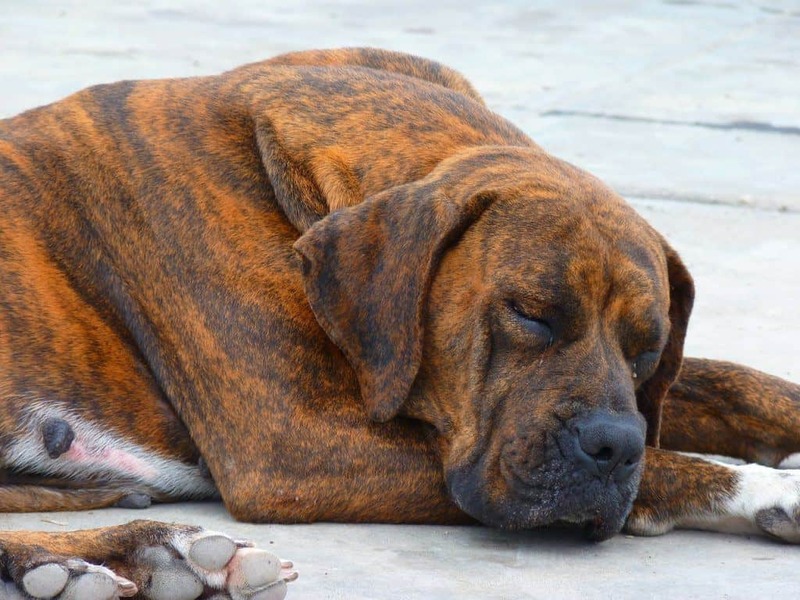 Large breed dogs are extremely susceptible to hip dysplasia and other joint diseases, and these two supplements can help reduce the discomfort and damage associated with such conditions. The best dog food for large dogs should contain a moderate amount of calories. Super-high-calorie foods, such as those fed to dogs to help them “bulk up” can lead to obesity, which is a significant problem for many large breeds, including Rottweilers, Mastiffs and Great Danes, among others. 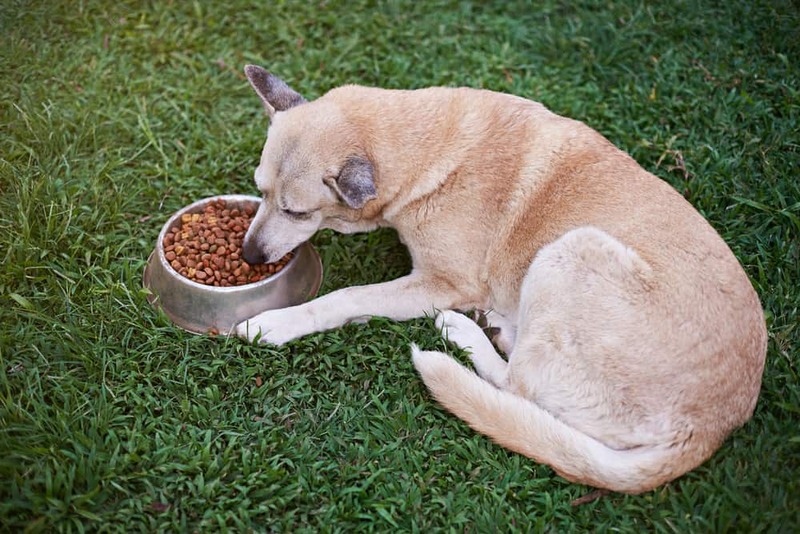 The best dog food for large breeds should feature large kibble to reduce the chances of bloat. Dogs who eat too quickly may be at increased risk of suffering from this life-threatening condition, but large kibble encourages your dog to chew his food more thoroughly, which will slow down the rate at which he eats. This can help reduce the chances of dog bloat occurring. Blue Buffalo is a name that has become synonymous with high-quality dog foods, and their Life Protection Large Breed Chicken and Brown Rice Formula is one of their most celebrated recipes. Made with all of the things you’d want in a best dog food for large breeds, including whole proteins, whole grains and an array of nutritious fruits and vegetables, this recipe will help keep your dog healthy and happy for years to come. User Reviews: Most owners raved about BLUE Buffalo Large Breed Chicken and Rice Formula, and several reported that it helped to reduce their dog’s problems with food allergies, joint problems and poor digestion. Most dogs appear to love the taste, and it is priced very reasonably for the quality. Bottom Line: There aren’t many dog food recipes that are as well-suited for large dogs on the market as this one is. It satisfies nearly every criterion you’d want in a good large breed dog food, and provides your dog with plenty of omega-3 fatty acids and antioxidants. Additionally, it is fortified with three different probiotic strains to help foster proper digestive function. Wellness Complete Health Large Breed is designed to provide your big canine with all of the nutrition he needs and a taste he loves. Like all other Wellness Complete Health products, this recipe is backed by the manufacturer’s wellness guarantee and is sure to keep your dog looking and feeling his best. Ingredients:Deboned Chicken, Deboned Whitefish, Chicken Meal, Oatmeal, Ground Peas, Ground Barley, Ground Brown Rice, Tomato Pomace, Salmon Meal, Chicken Fat (preserved with mixed tocopherols, a natural source of Vitamin E), Tomatoes, Natural Chicken Flavor, Ground Flaxseed, Carrots, Spinach, Sweet Potatoes, Apples, Blueberries, Vitamins [Beta-Carotene, Vitamin E Supplement, Ascorbic Acid (Vitamin C), Vitamin A Supplement, Niacin, d-Calcium Pantothenate, Riboflavin, Vitamin D-3 Supplement, Pyridoxine Hydrochloride, Thiamine Mononitrate, Folic Acid, Biotin, Vitamin B-12 Supplement], Minerals [Zinc Sulfate, Zinc Proteinate, Iron Proteinate, Ferrous Sulfate, Copper Proteinate, Copper Sulfate, Manganese Proteinate, Manganese Sulfate, Sodium Selenite], Glucosamine Hydrochloride, Chondroitin Sulfate, Choline Chloride, Taurine, Chicory Root Extract, Yucca schidigera Extract, Mixed Tocopherols (a natural preservative), Dried Lactobacillus plantarum, Enterococcus faecium, Lactobacillus casei, Lactobacillus acidophilus fermentation products, Rosemary Extract. User Reviews: Most owners love the nutrition and impressive ingredient list Wellness Complete provides, and most dogs seem to love the taste. Several owners reported that their dog exhibited improved health after switching to this recipe; some dogs seemed to exhibit less joint pain after making the switch, while others stopped suffering from skin problems. Bottom Line: If you are looking for a top-notch large breed dog food, and you don’t mind paying for a premium product, it is hard to go wrong with Wellness Complete Health Large Breed Formula. There aren’t many obvious drawbacks to the food, and it includes the types of ingredients most owners want for their dog. Like most IAMS products, PROACTIVE HEALTH Large Breed Adult Formula is a good large breed dog food designed for owners on a budget. As one of the more affordable choices on the market, you’ll obviously have to forego some of the bells and whistles other foods provide, but it is still an adequate, if not spectacular, food for your big dog. User Reviews: Despite not including many of the high-end features that are common to some other foods, most owners were very satisfied with IAMS’ large breed recipe. The only major complaints about the product related to one-off shipping problems (which can occur with any food) and the occasional dog who found the food unpalatable. Bottom Line: IAMS PROACTIVE HEALTH Large Breed Adult demands consideration for owners working with a limited budget. The food satisfies many of the criteria owners want in a dog food, and most dogs appear to find it tasty. Also, unlike many other budget-friendly options that feature a meat meal as the first ingredient, chicken is the first item on this food’s ingredient list. EUKANUBA’s Adult Large Breed Chicken Formula is a reasonably high-quality recipe that is priced at a level most dog owners can afford. Like many other budget-priced dog foods, EUKANUBA concentrates on providing the basics, rather than adding a bunch of expensive ingredients and additives. This way, your dog can enjoy a healthy, nutritious food that won’t bust your budget. User Reviews: The majority of owners who tried EUKANUBA Adult Large Breed Chicken Formula were quite pleased with the product. Several owners noted that their dog loved the taste and seemed just as healthy as when fed higher-priced alternatives. Comments regarding improved coat shine were very common, and a few owners even reported their dog exhibited improved mobility after making the switch. Bottom Line: Owners shopping for an affordable, yet nutritious dog food for their large breed dog should definitely give EUKANUBA Adult Large Breed Chicken Formula a try. It is one of the few budget-priced foods that specifically addresses the needs of large dogs, such as by including joint-supporting supplements, among other things. Nature’s Recipe Grain-Free Large Breed Formula is one of the few grain-free dog foods available at a low price point. Full of natural ingredients like chicken, sweet potatoes, apples, pumpkin and more, this food provides almost everything your big dog needs to stay healthy and feeling his best. Ingredients: Chicken, Chicken Meal, Potato Flour, Pea Protein, Peas, Sweet Potato, Poultry fat (Preserved with Mixed Tocopherols), Apples, Pumpkin, Natural Flavor, Tapioca Starch, Tomato Pomace, Salt, Canola Oil (Preserved with Mixed Tocopherols), Potassium Chloride, Choline Chloride, Vitamins (Vitamin E Supplement, L-Ascorbyl-2-Polyphosphate (Source Of Vitamin C), Inositol, Niacin Supplement, Vitamin A Supplement, d-Calcium Pantothenate, Thiamine Mononitrate, Beta-Carotene, Riboflavin Supplement, Pyridoxine Hydrochloride, Menadione Sodium Bisulfite Complex, Vitamin D3 Supplement, Folic Acid, Biotin, Vitamin B12 Supplement), Minerals (Zinc Proteinate, Ferrous Sulfate, Zinc Oxide, Iron Proteinate, Copper Sulfate, Copper Proteinate, Manganese Proteinate, Manganous Oxide, Calcium Iodate, Sodium Selenite), Lactic Acid, Citric Acid (Used as a Preservative), L-Carnitine, Yucca schidigera Extract, Rosemary Extract. User Reviews: The majority of owners were quite happy to find an affordable grain-free option for their dogs, especially one that dogs seemed to find so palatable. Several owners noted that the food helped improve their dog’s elimination habits, which is likely due to the high fiber content of the food and the inclusion of pumpkin in the recipe. Bottom Line: Although Nature’s Recipe doesn’t have a lot of the features you’d expect from a premium dog food, such as joint-supplements (although chicken meal provides some glucosamine and chondroitin) and probiotics, it is a good grain-free recipe that is much more affordable than many other corn- and wheat-free foods. If you are looking for a grain-free dog food for your large breed dog, Nature’s Recipe deserves serious consideration. Eagle Pack Natural Large Breed Recipe is a wholesome and nutritious pet food designed to provide your large breed dog with the kind of nutrition his body needs. And despite being priced very affordably, Eagle Pack Natural contains a number of the same supplements that premium foods do, such as probiotics and joint supplements. User Reviews: Many owners were very pleased with Eagle Pack Natural Large Breed Recipe, citing improvements in their dog’s coat condition, mobility, digestion and energy level. Additionally, many owners were happy to have a grain-free option available at a relatively low price point, and most dogs seemed to find the food delicious. Bottom Line: While Eagle Pack Natural Large Breed Recipe is an affordable US-made, grain-free option that is fortified with glucosamine and a variety of probiotic bacteria; it is not made with a whole protein. This is pretty disappointing for such an otherwise-excellent food, but some owners will likely find this an acceptable trade-off, given the other benefits the food provides. BLUE Wilderness Large Breed Recipe is a premium large breed dog food that provides everything you could possibly want for your big canine, including joint supplements, antioxidant-rich fruits and vegetables and a number of probiotic supplements. An all-natural, grain-free product, BLUE Wilderness Large Breed Recipe is also made without artificial flavors, colors or preservatives. User Reviews: The vast majority of owners who tried BLUE Wilderness’ large breed dog food were very happy with their choice. It helped improve the mobility and coat condition of many dogs, and several owners also reported improvements in their dog’s digestive performance. Additionally, most dogs loved the taste. The only complaints about the food related to shipping and delivery problems, aside from a few dogs who didn’t find the food palatable. Bottom Line: If you are seeking a premium dog food for your large breed dog and you don’t mind paying for quality, BLUE Wilderness Large Breed Recipe may be the best option available. Packed with just about every high-end ingredient and supplement you’d want, this food will satisfy even the most discriminating owners (and their dogs). NUTRO ULTRA Large Breed Adult Recipe is a nutritious and delicious food that is designed to meet your large-breed dog’s specific nutritional needs. Fortified with both glucosamine and chondroitin and made with several different fiber sources, this recipe may help improve your dog’s mobility and digestive performance. Ingredients: Chicken, Chicken Meal (source of Glucosamine and Chondroitin Sulfate), Whole Brown Rice, Brewers Rice, Rice Bran, Whole Grain Oatmeal, Chicken Fat (preserved with Mixed Tocopherols), Natural Flavor, Salmon Meal, Lamb Meal (source of Glucosamine and Chondroitin Sulfate), Dried Plain Beet Pulp, Whole Flaxseed, Sunflower Oil (preserved with Mixed Tocopherols), Potassium Chloride, Choline Chloride, DL-Methionine, Salt, Mixed Tocopherols and Citric Acid (preservatives), Dried Coconut, Whole Chia Seed, Dried Egg Product, Tomato Pomace, Dried Kale, Dried Pumpkin, Dried Spinach, Dried Blueberries, Dried Apples, Dried Carrots, Zinc Sulfate, Niacin Supplement, Biotin, Vitamin E Supplement, D-Calcium Pantothenate, Iron Amino Acid Chelate, Riboflavin Supplement (Vitamin B2), Vitamin B12 Supplement, Selenium Yeast, Pyridoxine Hydrochloride (Vitamin B6), Copper Amino Acid Chelate, Manganese Amino Acid Chelate, Vitamin A Supplement, Thiamine Mononitrate (Vitamin B1), Vitamin D3 Supplement, Folic Acid, Rosemary Extract. User Reviews: The reviews of NUTRO ULTRA Large Breed Adult Recipe were incredibly positive. Most owners raved about the food’s ability to improve their dog’s coat condition and mobility, and dogs seemed to love the taste. Additionally, many owners were happy to find a non-GMO food that featured so many nutritious ingredients. Bottom Line: NUTRO ULTRA Large Breed Adult is a premium food for large breed dogs that features most of the characteristics you’d want, but it is also priced like a premium product. It will likely satisfy most owners and their dogs, but, at this price point, owners who are not interested in avoiding genetically modified organisms can probably find a better option, such as a recipe that contains probiotics. Purina’s Pro Plan lineup is comprised of several different recipes designed for different types of dogs. Their Weight-Management Large Breed Formula seeks to address the specific health issues common to large dogs, including joint problems and obesity, without compromising on taste or brandishing a high price tag. Ingredients: Chicken, Brewer’s Rice, Whole Grain Wheat, Poultry By-Product Meal (Natural Source of Glucosamine), Corn Gluten Meal, Oatmeal, Barley, Pea Fiber, Fish Meal (Natural Source of Glucosamine), Animal Fat Preserved with Mixed Tocopherols (Form of Vitamin E), Animal Digest, Fish Oil, Wheat Bran, Dried Egg Product, Salt, Potassium Citrate, Potassium Chloride, Zinc Sulfate, Ferrous Sulfate, L-Ascorbyl-2-Polyphosphate (Source of Vitamin C), Manganese Sulfate, Niacin, Vitamin A Supplement, Calcium Carbonate, Copper Sulfate, Calcium Pantothenate, Garlic Oil, Pyridoxine Hydrochloride, Vitamin B12 Supplement, Thiamine Mononitrate, Riboflavin Supplement, Calcium Iodate, Vitamin D3 Supplement, Menadione Sodium Bisulfite Complex (Source of Vitamin K Activity), Folic Acid, Biotin, Sodium Selenite. F-4481. User Reviews: Most owners were pretty happy with Pro Plan Focus Weight Management Large Breed recipe, although a few noted problems with the shipping and delivery of the product. Some owners complained that this recipe had a bad odor, but dogs don’t seem to mind and most found it quite tasty. A few owners noted improvements in their dog’s mobility, and several reported that the food helped their overweight dog slim down a bit. Natural Balance Original Ultra Whole Body Health Large Breed Recipe is a high-quality large breed dog food, fortified with a number of antioxidant-rich ingredients, vitamins and minerals to ensure your dog receives the nutrition he needs. Designed to support your large breed dog’s joint health, this food may help improve your dog’s mobility and reduce the symptoms of arthritis or hip dysplasia. Ingredients: Chicken, Brown Rice, Chicken Meal, Oats, Potatoes, Dried Peas, Pea Protein, Duck Meal, Carrots, Chicken Fat (preserved with Mixed Tocopherols), Natural Flavor, Menhaden Oil, Pea Fiber, Tomato Pomace, Flaxseeds, Oat Fiber, Salt, Potassium Chloride, DL-methionine, Dicalcium Phosphate, Choline Chloride, Taurine, Minerals (Zinc Amino Acid Chelate, Zinc Sulfate, Ferrous Sulfate, Iron Amino Acid Chelate, Copper Sulfate, Copper Amino Acid Chelate, Sodium Selenite, Manganese Sulfate, Manganese Amino Acid Chelate, Calcium Iodate), L-ascorbyl-2-polyphosphate (Source of Vitamin C), L-tryptophan, Vitamins (Vitamin E Supplement, Niacin, d-Calcium Pantothenate, Vitamin A Supplement Riboflavin Supplement, Thiamine Mononitrate, Biotin, Vitamin B12 Supplement, Pyridoxine Hydrochloride, Vitamin D3 Supplement, Folic Acid), Mixed Tocopherols and Citric Acid (preservatives), Dried Cranberries, Dried Blueberries, Dried Spinach, L-Lysine, Dried Kelp, Dried Yucca schidigera Extract, Rosemary Extract. User Reviews: Most owners were very happy with Natural Balance Original Ultra, and reported that their dog’s coat quality and energy level increased after making the switch. Several owners even noted that this food reduced their dog’s digestive problems and reduced the amount of waste and gas they produced. By and large, most dogs appeared to like the taste as well. Bottom Line: Natural Balance is a reasonable choice for owners seeking a premium product, but given its price point, we’d have liked to see probiotics included in the formula. Nevertheless, based on the reviews of other dog owners, Natural Balance Original Ultra Whole Body Health Large Breed Recipe deserves consideration by owners of dogs with digestive issues or joint problems. Taste of the Wild is designed to provide your dog with an evolutionarily appropriate diet that mimics the diet of wild canines. Made with premium proteins and antioxidant-rich fruits and vegetables, Taste of the Wild is a grain-free food that will provide your large dog with exactly the type of nutrition he needs. Ingredients: Buffalo, lamb meal, sweet potatoes, egg product, pea protein, peas, potatoes, canola oil, tomato pomace, roasted bison, roasted venison, beef, flaxseed, potato fiber, natural flavor, ocean fish meal, salmon oil (a source of DHA), salt, choline chloride, dried chicory root, Yuccaschidigera extract, tomatoes, blueberries, raspberries, dried Lactobacillusacidophilus fermentation product, dried Bifidobacteriumanimalis fermentation product, dried Lactobacillusreuteri fermentation product, vitamin E supplement, iron proteinate, zinc proteinate, copper proteinate, ferrous sulfate, zinc sulfate, copper sulfate, potassium iodide, thiamine mononitrate (vitamin B1), manganese proteinate, manganous oxide, ascorbic acid, vitamin A supplement, biotin, niacin, calcium pantothenate, manganese sulfate, sodium selenite, pyridoxine hydrochloride (vitamin B6), vitamin B12 supplement, riboflavin (vitamin B2), vitamin D supplement, folic acid. User Reviews: Most owners love the fact that Taste of the Wild is made with a variety of excellent proteins, and most dogs love the way these proteins taste. Several owners noted improved energy levels, coat condition and elimination habits after trying this food, likely due to the absence of grains and the included probiotic strains. Bottom Line: Taste of the Wild is definitely one of the best dry dog foods for large breeds; a popularly reviewed and highly rated dog food on our list. It has all the protein your dog will need to reach his full-size potential, and it contains plenty of omega-3 fatty acids, which will help protect your dog’s joints as he ages. This food comes with all of the major features you’d want in a dog food, and it is more affordably priced than many comparable foods. Be sure to check out our comprehensive review of Taste of the Wild in our Taste of the Wild vs Blue Buffalo comparison here. 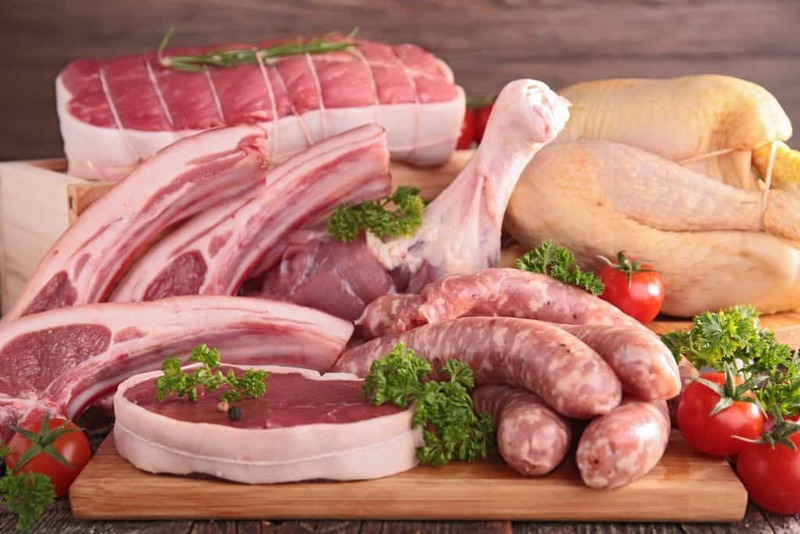 Dogs are omnivores, but the bulk of their calories (within reason) should come from whole protein sources, such as chicken, beef, lamb or fish. Single-ingredient meat meals are a good source of protein (in some cases, they provide more protein than whole foods do, thanks to the lack of water), but they should be featured farther down the ingredient list. 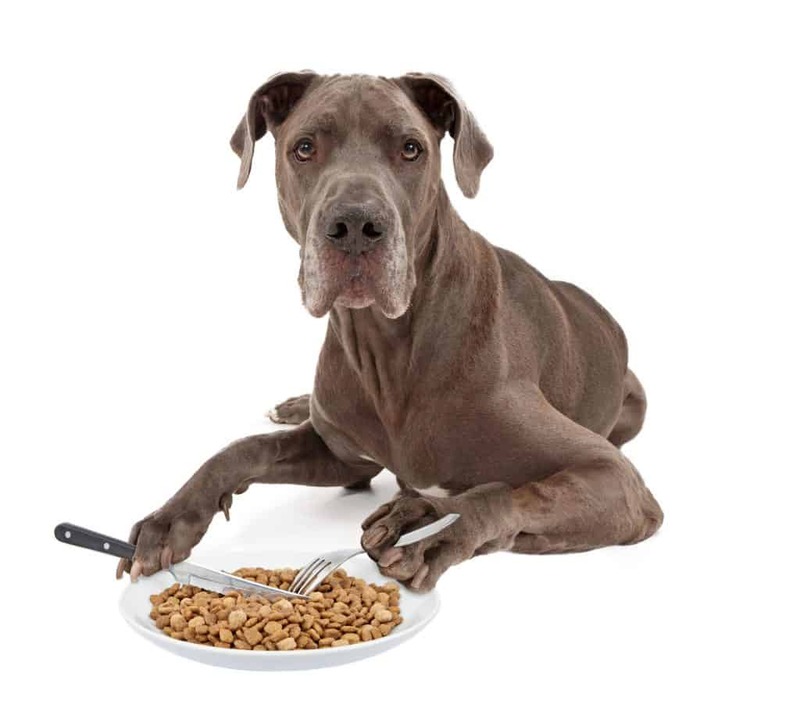 While most dog foods are usually safe for your pet to consume, you don’t want to take chances. 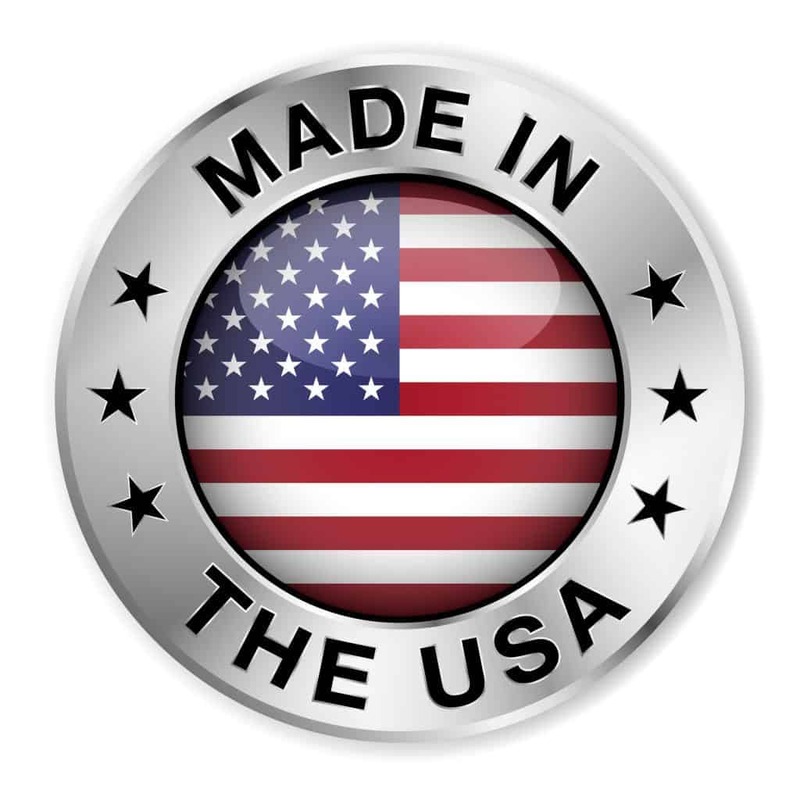 Accordingly, it is wisest to select foods made in the USA, Canada, Australia, New Zealand or Western Europe, where quality and safety standards are higher than many other countries. While byproducts and meat meals are valuable and nutritious components of many dog foods (even if they seem unpalatable to owners), it is important that the animals used in their creation are from high-quality sources. One of the best ways to do so is by avoiding meat meals and byproducts that are not attributed to a single protein source. For example, “duck meal” is perfectly acceptable, while “meat meal” or “animal meal” is not. 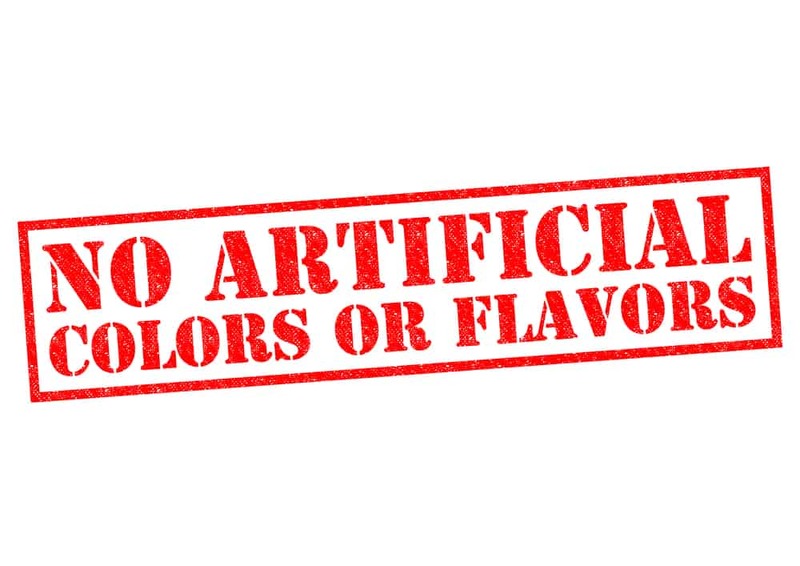 Dogs typically like foods that are made with high-quality ingredients, so artificial flavors are unnecessary; and they don’t care about the color of their food, so dyes are not needed either. Because both of these types of additives can trigger food allergies, they are best avoided. Omega-3 fatty acids are important for limiting inflammation and avoiding chronic diseases. Some omega-3-fatty-acid-rich ingredients include things like salmon, venison, olive oil and flaxseed, among others. If you find a food that lacks omega-3 content, yet is otherwise perfect, you can always add omega-3 fish oil supplements to your dog’s food. Probiotics are beneficial bacteria, which help your dog’s body absorb nutrients from his food. They also regulate the digestive system and help to crowd out pathogenic species. 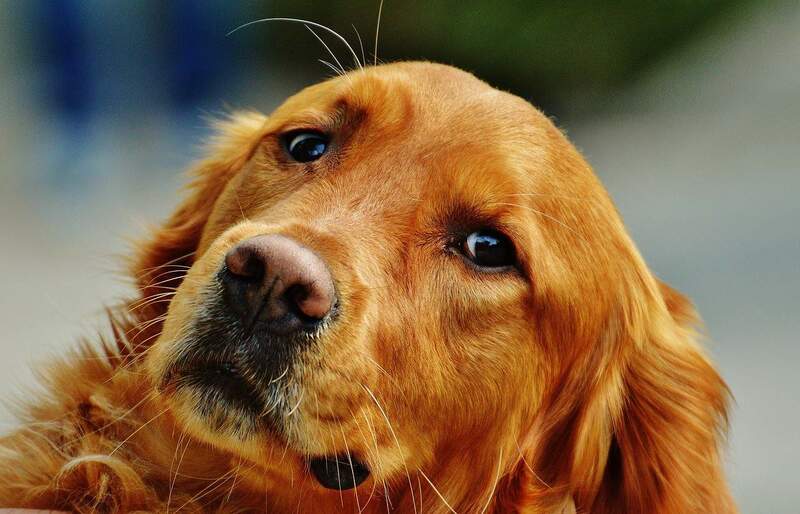 You can add dog probiotics to foods that lack them, just like you can with omega-3 fatty acids. Have you found a great dog food for large breeds? We’d love to hear about your experiences in the comments below. Be sure to tell us which flavor or recipe your dog likes best, and explain what it is about the food that makes you like it.